From day one, you will have a team dedicated to making your dream home a reality. We strive to keep our process seamless - so the hands cutting your frame will also be the ones that erect it. Ken began his career 40 years ago, restoring antique New England homes. Back then, projects involved disassembling then moving and rebuilding entire frameworks from seventeenth century structures. He could sense the re-birth of timberframing in the east and had a passion to be a part of it. Through this work, Ken became enthusiastic about the design and assembly of timber frame buildings. He was especially fascinated with the historical background and unique story each structure told. Inspired by the professionals working with him, Ken developed his own expertise, expanding on traditional methods to accommodate innovative styles and designs. Ken strives to make South County Post & Beam the best in the business. He takes great pride in helping clients work through the stages of the design and building process, facilitating the journey toward successful, satisfying results. He is a member of TFGNA - Timber Framers Guild of North America and RIBA - The Rhode Island Builders Association. Ken's personal interests include spending time with his wife, Susan, and their golden retriever, Beau. He enjoys playing basketball, traveling, reading, and studying history and architecture. Josh was educated in finance and business at Northeastern University. He joined Ken in 1996 and began planning the expansion of South Country Post & Beam. Since then, he has brought significant growth and added a variety of innovative and technical resources to the company. Josh's responsibilities include overseeing the timber frame division and management of the team, real estate development, sales, client support and communication, as well as directing the company's overall operations. Always patient and composed, he has an innate capacity to undertake complex problems and direct desired outcomes. His favorite parts of the job are considering the possibilities for growth and helping clients achieve their goals. Josh's interests include spending time with his family, cooking, and traveling. Tony has over thirty years experience in the building industry, primarily in residential construction. From a very early age, Tony enjoyed building things and has turned that interest into a lifelong career. Now, Tony supervises all phases of a wide variety of projects. His favorite part of the job is the successful completion of a project with a client who is thrilled with the results. Tony's other interests include architecture, design, ocean sports, and winter sports. Mark has more than ten years experience working in the building industry, including steel detailing on large-scale projects and residential architectural design. He earned an associate's degree in Architectural Building and Engineering Technology from the New England Institute of Technology and a Bachelor of Fine Arts degree from the University of Rhode Island. Mark's daily responsibilities include developing frame designs and 3-D timber frame computer models for potential projects. He added timber joinery to the computer models and prepares shop drawings detailing the timber frame. Mark takes the architectural design documents through the entire process from schematic to completion. His favorite part of the job is taking the clients' ideas and developing a design that works for them. Mark's other interests include painting and art. Rob has thirteen years in the building industry, including hands on work. He earned his Bachelor of Arts degree at The University of New Hampshire with a major in geography and a minor in architecture. Rob's talents lie in CAD drawings and Sketch Up, and has been a daily contributor to ongoing projects. Rob's other interest include surfing, biking, and enjoying family friends' company. Steven earned his Bachelor of Science degree in Architectural Building Engineering Technology from New England Institute of Technology. Steve is instrumental is making the customers' dreams become a reality; from taking their concepts and developing construction documents to be used in the field to make it happen. Steve's other interest include running, biking, and making his own beer. He recently finished his first half marathon and will be training for a full marathon next year. Jonas’ extensive background in the architecture and building industry started with basic CAD courses in high school. His first job was as an intern for a prominent design/build architectural firm in his original hometown of Brattleboro, Vermont. Foregoing traditional school for “in the trenches training” from those in the industry, he quickly worked his way from intern to lead draftsman. From there Jonas spent his next 15 years working for a structural insulated panel manufacturer. Starting as a CAD designer he grew to deal with all aspects of the company, eventually becoming general manager. After acting as general manager for over five years, and ready for a change, Jonas relocated and joined our team. Jonas’ responsibilities for the company will be to usher clients through the overall process and to grow our client base. His long industry expertise will help ensure a smoothly run project – from the first design conversation to the last peg being driven. In his spare time Jonas can be found spending time with his family, playing golf and/or chess. Susan has been involved in interior design for many years. Her love of space and creating on overall sense of integration provides her clients with the feeling and look that they convey to her. Her ability to be receptive and interpret client ideas is her strength. Susan was educated in interior design at Rhode Island School of Design and has extensive experience in all interior phases of renovation and new construction. Her ability to harmoniously collaborate with all members of the team from concept, design, planning, and implementation ensures that projects will have trusted quality and attention to detail. Susan's coorperative and watchful temperament allows her to hold her clients' projects to heart. Her favorite part of the job is to stay disciplined enough to keep the end in sight so as not to overdo a design or clutter a space. Susan's personal interests include spending time with her husband, Ken, and cuddling with their grandchildren. South County Post & Beam was delighted when Todd joined the company in 2005. For more than 20 years Todd has been in the industry. Todd handles the site and travel logistics, directs frame raisings and manages panel installations. His favorite part of the job is collaborating and working as a team with his own crew and new professionals while on specific job locations. He is a member of The Timber Framers Guild of North America. Todd enjoys spending time with his family. Bill joined the company in 2001 and has become indispensable and extremely dedicated to his job. Bill is responsible for managing, monitoring and operating our Hundegger timber cutting machine which offers the latest in Computerized Numerical Control technology (CNC). His responsibilities include maintenance of the CNC joinery K2 machine and accurate and safe operation. His favorite part of the job is feeling satisfaction when a project is completed in its entirety. Bill enjoys spending time with his family, especially his grandsons Cameron and Carnell. Steve came to South County Post & Beam in 2001 and has become an integral part of the team ever since. After completing military duty at the Naval Submarine Base in Groton, Ct. his quest was on to find just the right timber frame company to work for. The right fit was found for both Steve and South County. Steve is one of our Hundegger operators and does program file review prior to cutting. He also is a sawmill operator, milling timbers and boards. Steve is also involved in timber processing and frame installations. Steve enjoys spending time with his wife Kelly and their dog Tug. 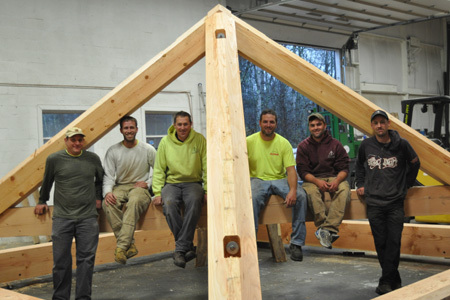 Our crew lives and breathes timber frame homes. They take great pride in their work and you will see that quality in all they do. The same crew that cuts and constructs your frame in our workshop will erect it onsite, providing seamless consistency. Seeing your timber frame home come to fruition will be one of the most thrilling times of your life. Our team provides fast response, day-to-day accessibility and flexible customer care. Our expert carpenters have many years of experience building and restoring a wide variety of timber frame structures. We are a company of designers, carpenters, joiners, planners, craftsmen, and support staff - we love what we do and it shows in our work.